Civil rights activist and education reformer Marnesba Tillmon Tackett was born in St. Louis, Missouri, to Ivory and Elizabeth Edwards Adkins on February 4, 1908. She grew up in Kansas City, Kansas. After graduating from Sumner High School in 1926, she married Joseph Edgar Tackett, who later became a minister. Tackett earned a degree in social sciences at Kansas City Junior College in Kansas in the 1930s. 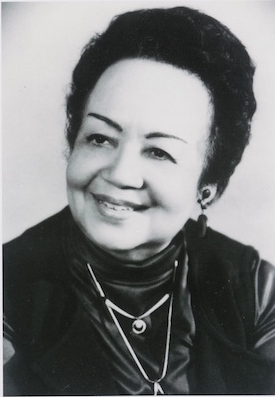 She was an active member of the National Association for the Advancement of Colored People (NAACP). During the 1940s, she participated in sit-ins to integrate lunch counters and theaters in Kansas. In 1952, Tackett moved to Los Angeles, California where she initially sold insurance and real estate. Educational segregation, however, attracted much more of her attention. Most African American children attended overcrowded, segregated public schools that provided only half-day sessions. Appalled by this situation, Tackett ran for and was elected chair of the education committee of the Los Angeles branch of the NAACP in 1954. She established the Committee to Better Schools and joined the American Civil Liberties Union (ACLU) in its protest against school segregation. In May of 1963, Christopher L. Taylor, president of the Los Angeles branch of the NAACP, formed the United Civil Rights Committee (UCRC) which included members of the NAACP, ACLU, and the Congress of Racial Equality. Tackett headed the education committee of the UCRC. In June, she and Taylor organized a mass march against segregated schools, the largest demonstration for civil rights in the history of the city. Two months later, Tackett helped ACLU and NAACP file a lawsuit against the Los Angeles Unified School District accusing them of deliberately segregating African American and Latino students. ACLU reintroduced an expanded suit in 1968. Two years later, Superior Court Judge Alfred Gitelson ordered the desegregation of Los Angeles schools. Tackett continued her important civic activity. She served as housing director of the Community Relations Conference from 1968 to 1973 and directed the Southern Christian Leadership Conference/West from 1976 to 1981. She also helped create and promoted Accelerating Home Education and Development which encouraged the involvement of parents in education as a means of student achievement. Marnesba Tillmon Tackett died in Los Angeles on December 17, 2007, at the age of 99. She was survived by a sister, a brother, seven grandchildren, and 12 great-grandchildren. Libby Clark, “A ‘Taste of History’ Living Legends: Battles for Minority Teachers/Busing for Better Education Won; Marnesba Tackett Spearheaded Educational Reform for Blacks in L.A.,” Los Angeles Sentinel, March 17, 1999; Josh Sides, L.A. City Limits: African American Los Angeles from the Great Depression to the Present (Berkeley, CA: University of California Press, 2003); Jocelyn Y. Stewart, “Marnesba Tillmon Tackett, 1908-2007. Activist helped desegregate L.A. schools,” Los Angeles Times, January 31, 2008.